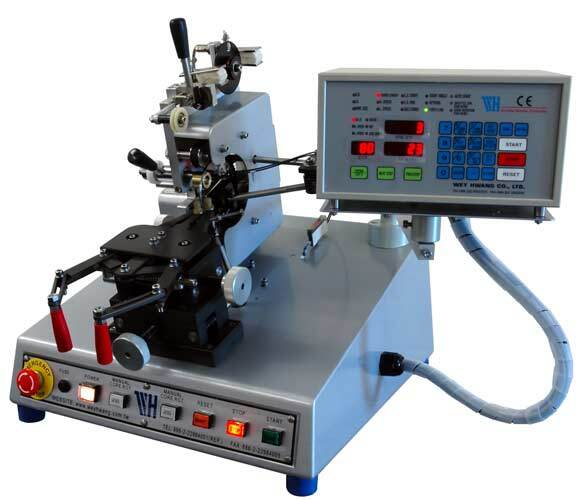 WH-900 toroid winding machine with advanced digital control, suitable for winding small toroidal devices. It is available with 4 and 6 inch toroid winding heads in either belt or side slider versions. The optical wire turns sensor has a "teach-in" function and can operate at winding speeds of up to 1500 rpm. 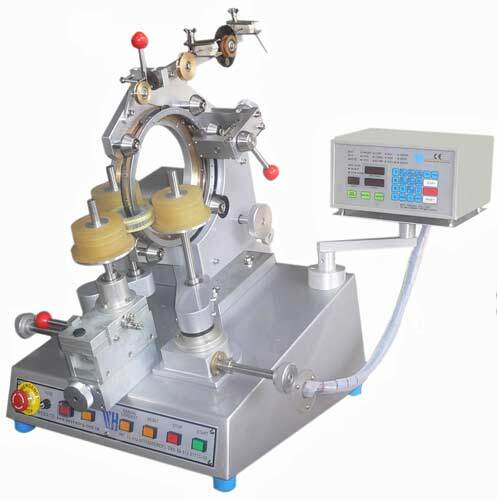 WH-900a toroid winding machine is suitable for winding medium sized toroidal devices and can be equipped with either 8 or 12 inch belt or side slider type toroid winding heads. It is equipped with an advanced digital control and optical wire turns sensor with "teach-in" function and can operate at winding speeds of up to 1200 rpm. 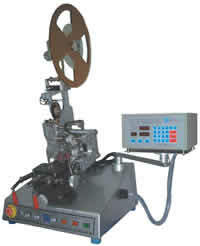 WH-900t toroid taping machine designed for winding insulation tape onto toroids with small inside diameters. It is equipped with an advanced digital control unit and a six inch toroid taping head. The machine is capable of applying insulation tape to toroidal coils at speeds of up to 300 rpm. 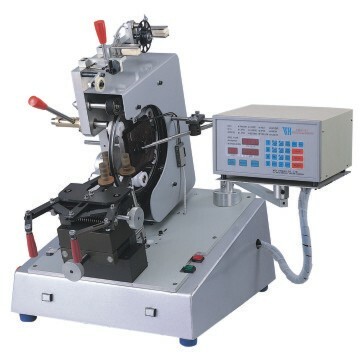 The WH-300g7 digitally controlled toroid winding machine is equipped with a 7 inch gear rack type winding head for winding small toroidal coils. The constant tension gear rack system enables wire to be placed on the toroidal core with greater accuracy than is usually achievable with most other methods. General winding quality is improved, with reduced occurrence of crossed turns. WH-300 large toroid winding machine with 10 and 13 inch gear rack head options, and a choice of 10 and 13 inch insulation taping heads. Ideal for winding larger toroids with heavy wire and for taping wound product. 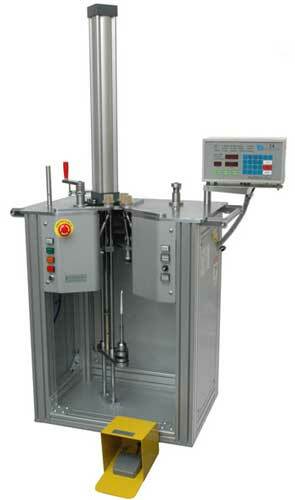 There is full digital control of the toroid winding process, and the machine can operate at speeds of up to 250 rpm. WH-200 advanced hook type toroid winding machine (pull winder) for winding toroids with a small inside diameter with large wire - typically chokes, ballasts and filters. The digital controller provides automatic toroid core rotation and accurate turns count. The stroke length is fully adjustable for maximum speed and efficiency. 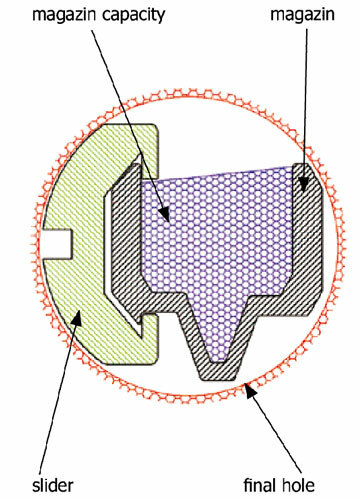 An innovative method of applying insulation tape to toroidal products using a focused stream of compressed air to carry the tape through the centre of the toroid. A simple and highly cost effective method, especially in applications where the cost of an automatic toroid taping machine cannot be justified. 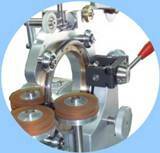 Shuttles, magazines & sliders for any toroid winding machine.